College football is a cut-throat sport in each and every aspect. Athletes can fall from the big stage to the far side of the bench over the course of just few plays. Large collegiate programs throw massive amounts of money at their team, and they demand immediate results. Taking into account the University of Alabama’s newly announced $600,000,000 football initiative, or Northwestern’s $260,000,000 football specific training facility (ESPN), these teams want to win and they’ll compete with one another for how many dollars worth they want it. But this is all for what? In the case of just about every college football team in the Power 5 conferences, the goal is very simple: a conference title, and a trip to the College Football Playoff. In the quest for wins on the football field, loyalty is often hard to come by. A Heisman contending quarterback can be hated by his own fan base after a few interceptions. Fans often tire of a coach who frequently wins, but not enough for his demanding fanbase. It’s this severe lack in loyalty that makes the the current situation Michigan football finds itself in so fascinating. After being brought to Michigan in the summer of 2015, three seasons of football have lead to 10-3,10-3, and 8-5 seasons respectively, and the Wolverines have begun the 2018 season 2-1. One might expect this mediocrity from just an average coach. However, Jim Harbaugh is considered far more than that in Ann Arbor. Talk to just about any Michigan football fan and that’s the story you’ll receive. Jim Harbaugh, father of Jesus Christ. This could not be a more misguided opinion. 1-6 against rivals, and having never beaten Ohio State or Notre Dame, Harbaugh will receive a seven million dollar salary this year —in addition to two million more dollars in the form of a life insurance policy— as the third highest paid coach in America (USA Today). It’s not that these fans are misinformed, or the wool is being pulled over their eyes. They have all the facts, and they genuinely love this man. Looking simply at Harbaugh’s record, one might say that he in no way deserves to be fired and agree to the notion that the the program is just inches from its first conference title in 14 years. To this I bring the argument of former Texas Longhorns coach and National Champion Mack Brown. After two ‘Big 12 Coach of the Year’ awards and becoming the winningest coach in the Longhorn’s long impressive history, Brown was forced to resign after an 8-5 season that included defeating their storied rival, twelfth ranked Oklamaha. Not only was Brown forced to resign, the program wanted him gone so bad they were willing to pay $2.75 million in a buyout before even beginning to pay new head coach Charlie Strong. This is a demmanding business, and the fans want results. Why the Wolverine faithful don’t hold Harbaugh to the same critical standards simply cannot be explained. Another argument that often arises in defense of the coach is that he’s always “just so close”. A few yards here or there and Michigan would be, could be, should be, a national champion. Except J.T. Barrett wasn’t short, and “Oh, he has trouble with the snap…” is a phrase that will live in infamy. Harbaugh is 1-6 against rivals, and there’s still a strong consensus amongst fans — contradicting past points — that these rivalry games are worth more than anything else. Harbaugh can’t beat his rivals; if he can’t beat his rivals, he can’t win titles. Immediately following the firing of former head coach Brady Hoke after Michigan’s 7-5 2014 season, the Wolverines looked to Harbaugh. The fanbase was begging him to leave his NFL job with the 49ers and come coach for his hometown. Still beloved for his playing days at Pioneer High School, and his time as a quarterback under coach Bo Schembackler, he was the perfect choice for fans. Having recently fired the athletic director, Michigan went about hiring “Acting AD” Jim Hacket with one very simple goal in mind; get Jim Harbaugh back to Ann Arbor. Since acquiring the coach, Harbaugh has gone about getting recruits in numerous fun and attention seeking ways, like sleeping in a kicking recruits’ tree house, and setting up satellite camps in rival areas in attempts to poach recruits. U of M fans eat up this type of thing, but all this flare is missing one thing… wins. Only championships can make this type of act, “cool”. Patriots fans love Bill Belichick refusing to answer questions from the press. Basketball fans love when Coach Pop screams and curses at his players and officials. What do these two beloved coaches have that Jim Harbaugh doesn’t? Championships. Lots and lots of championships. America loves a winner, but for whatever reason, Michigan fans are willing to pay Harbaugh gargantuan amounts of money in exchange for more constant mediocrity. Not only are Wolverines happy to keep Harbaugh around, many want to make sure he stays… forever. Reported by Fox Sports’ Brady Quinn last fall, Michigan is working to create a lifetime deal with the coach. When any other coach in his position should be on the hot seat, fearing for his job, Harbaugh could have lifetime job security without consequences for losing. For the Wolverines, the rest of this season remains uncertain. For a team who struggles to protect their new quarterback, it would take a series of miracles to defeat Penn State or Ohio State and earn a trip to a Big 10 Championship. 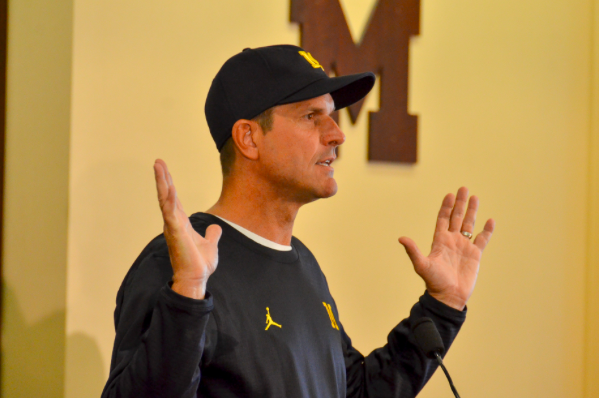 It’s time for the fanbase to set asides his 1980’s playing days and coaching successes elsewhere, and take a long hard look at Harbaugh’s record and the direction he’s taking this football program. Great points made by a talented writer… keep up the good work!